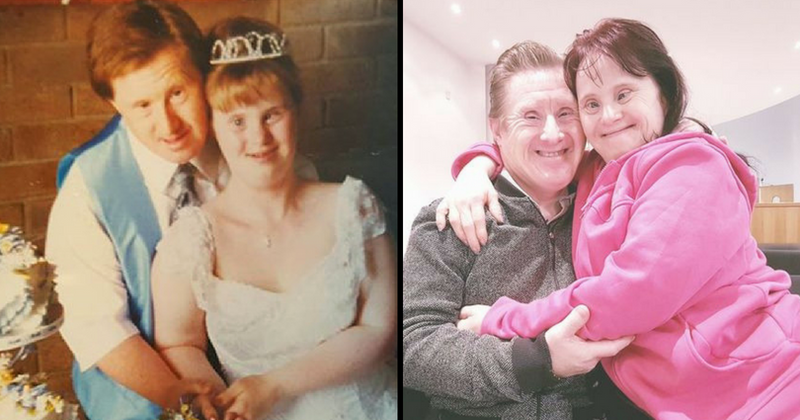 Maryanne and Tommy Pilling from Essex proved that love sees no disabilities when they tied the knot in 1995. The couple fell in love and dated for 18 months before tying the knot. People with Down Syndrome are often seen as being incapable of living a normal life. That stigma is worse for people who have other mental disabilities as well. Many would argue that anyone living with a disability can't live a life like a 'normal' person can. One such belief is that people with Down syndrome can't get married. But 23 years ago, this couple proved everyone wrong. Maryanne and Tommy Pilling from Essex proved that love sees no disabilities when they tied the knot in 1995. According to Daily Mail, the couple fell in love two decades ago and decided to marry, but initially faced a lot of criticism for their decision. But the two of them had a loving support system, with their biggest cheerleader being Maryanne's mother, Linda. The couple appeared on the British TV show 'This Morning', to mark their 23rd year of marriage. Tommy got emotional as he told the hosts about his love for his wife. " I do love her," he said to Philip Schofield and Holly Willoughby, holding back tears. Maryanne talked about her wedding dress, and how she wore her hair on the day of her marriage. Her mother proudly walked the blushing bride down the aisle, to a smitten Tommy. "I got in trouble for running," said Maryanne, who recalled sprinting down the aisle towards the end! Linda describes their relationship as 'pure' and and 'magical'. Tommy and Maryanne dated each other for 18 months before Tommy approached Linda to ask for her daughter's hand in marriage. Linda was ecstatic when she found out and took Tommy out to shop for a ring, swapping it for the toy one he got in a vending machine. Linda faced criticism for letting her daughter get married. "It was other parents who couldn’t understand why I was willing to take it as far as I did," she said. But her daughter and loving husband changed Linda's life, along with people's perceptions of disabilities. "I could never give back what she and Tommy have for me," the proud mother said. The couple lived with Linda for a while before moving into a home next door. People on the internet were all for the celebration of the couple. Many praised Linda for her encouraging presence in the happy couple's life. Twitter users cheered the couple on. The internet showered Maryanne and Tommy with lots of love and many more happy years of marriage. Such a heartwarming story on @thismorning 😍😍 I hope I'm that happily married after 23 years! Down syndrome what?? Down syndrome who?? Maryanne and Tommy struck a chord in nearly everyone's hearts. The internet was smitten by their story. The perception of disabilities is now changing. The positive conversation around specially abled people has given the rest of the world a changed idea of their capabilities. This continued positivity is cheering on many others who either live with disabilities or live with someone who has disabilities.